Constable Popatsinh S Vaghela had allegedly hid Rajendrasinh R Vaghela alias Rajbha, accused of arson and rioting, from the police team for at least four days. Rajbha went into hiding afterwards, and police could not arrest him for several days. 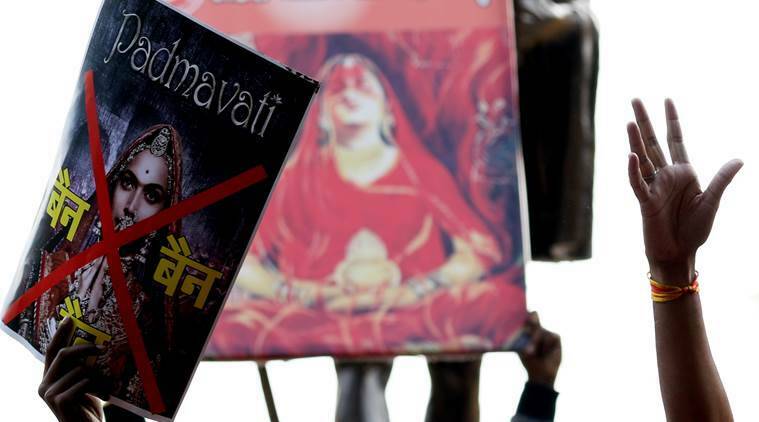 Police in Sanand on Monday arrested a constable for allegedly helping the main conspirator behind the January 23 arson at multiplexes against the release of Padmaavat from dodging arrest. Constable Popatsinh S Vaghela had allegedly hid Rajendrasinh R Vaghela alias Rajbha, accused of arson and rioting, from the police team for at least four days. Three days ago, Ahmedabad city police had suspended three constables, posted at Satellite police station, who had let Rajbha go from the police lock-up. Sources said that at least six to seven policemen are said to be under the scanner for their roles during the violence by Rajput community. Some policemen, mostly from Sanand, were questioned for reportedly hobnobbing with the suspects at the scene of offence and also at Vastrapur and Satellite police stations. Popatsinh Vaghela, in his mid 30s, is also from Sanand where the conspiracy was allegedly hatched to launch violent protests at multiplexes against screening of the movie last Tuesday. Police said that Rajbha had been detained on the same night and brought to Satellite police station, but was allowed to go. In the FIR, he was identified as “Sanand Shakti Tractor Wala” as he owns a showroom of tractors in Sanand town. Sources said that his father was among those farmers who had benefitted immensely by selling land for the Nano car plant. Rajbha went into hiding afterwards, and police could not arrest him for several days. He was finally arrested on January 27. Sources said that police zeroed in on constable Popatasinh after his phone call to Rajbha was intercepted. “Popatsinh used to talk to Rajbha whenever he would get information about police movement. They used to talk in code words to warn Rajbha about the police team’s locations,” said Sanand Deputy Superintendent of Police K T Kamariya. Popatsinh has been booked under Indian Penal Code section 221 (intentionally omits to apprehend a suspect) and 225 (resistance or obstruction to lawful apprehension of another person). When asked if there are other inquiries going on against policemen for their roles during the violence he said “there are general inquiries going on and results are awaited”. Vastrapur police had lodged three FIRs, and one FIR was lodged at Satellite police station following the arson and rioting in which over 100 bikes were set on fire and dozens of vehicles damaged. Members of the Rajput community had also vandalised shops, eateries apart from the multiplexes. The FIRs have named Karni Sena leaders Prithvirajsinh Vaghela, a resident of Sanand, Surendrasinh Sisodiya, advocate Kiritsinh Solanki, Digubha Vaghela, Mahipatsinh Chauhan and Pratipalsinh G Chauhan among others. Meanwhile, Rajbha was produced before a city court on Monday after his police custody ended. He was sent to judicial custody. He has also filed a bail application.